Canon PowerShot SX280 HS 12.1 MP CMOS Digital Camera with 20x Image Stabilized Zoom 25mm Wide-Angle Lens and 1080p Full-HD Video (Red) » DVD's, Blu-Ray, Videos, TV's, Cables, Gear - Everything you need to have to setup to Entertain! The PowerShot SX280 HS features a powerful 20x Optical Zoom Lens that delivers outstanding optical performance and versatility. The camera's lens embodies the quality and legacy of Genuine Canon Optics with advantages that go far beyond making the camera slim enough to slip in your pocket and carry anywhere. With a range of 25–500mm (35mm equivalent), the lens gives you the power to capture the full breadth of scenes, with details you've never captured before. Images are bright and vivid with spectacular clarity thanks to Optical Image Stabilization. You have complete control of exposure, selecting both aperture and shutter speed manually. You set the aperture, controlling depth-of-field. The camera automatically selects the shutter speed. You select the shutter speed, and the camera automatically selects the appropriate aperture. 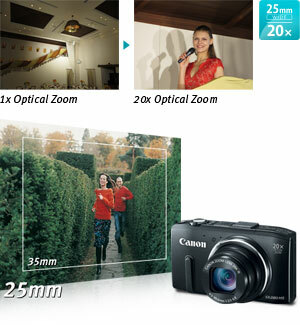 Automatically selects shooting settings for optimal quality and records a video clip every time you capture a still image. One day's worth of clips are then combined into a single video. The camera uses high shutter speeds to capture fast-moving subjects. The camera automatically takes the photo when people smile, wink, or get into frame. 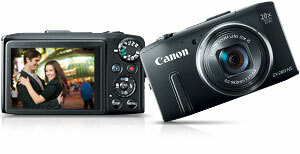 Captures fast-action shots at full resolution, providing continuous shooting when the shutter button is held down. Take clear and steady pictures at night without the use of a tripod. Capture underwater images with reduced backscatter effect. Optional Underwater Case required. Simulates photos taken with "toy" or pinhole cameras, darkening the image at the edges to create a vignette effect. Creates a hazy ambiance that's perfect for portraits and wedding photos. Disables flash, AF assist beam, and all camera sounds with one mode dial setting – so you can capture images in quiet areas. Record your clips in high speed (approx. 240 fps), and then watch your videos in slow motion. Canon's powerful 20x Optical Zoom and 25mm Wide-Angle lens with Optical Image Stabilizer delivers stunning images from up close or at a distance.